Tips and trick to use SAMSUNG CLOUD to backup all important data to Samsung Cloud Server. Please note, when we make this information, this service only available for Samsung Galaxy S8, S8+, S7, and S7 Edge, but of course more Samsung device will get this service later. Now we can backup almost all important data to Samsung Cloud Server. It is free for Samsung users. Many users get upset when their smartphone or tablet broken or lost or stolen, because they have many important data and interactive applications for daily activity at that device. With Samsung Cloud service, we can keep all data safe whenever our Samsung Device get some troubles. What is SAMSUNG CLOUD BACKUP ? Samsung Cloud is Free cloud storage for Samsung device users to backup all important files, private photos and videos or applications data. We can choose whatever files or applications to backup. This services is not active from beginning, we need to select one by one which need to backup. Samsung give 15 GB free storage to backup our data, if we need more then we have to choose paid service. The Samsung Backup and Restore to Samsung Cloud can be obtain automatically or manually. We can choose to use Wifi Only for backup our data automatically, because not all users have enough network provider data quota. 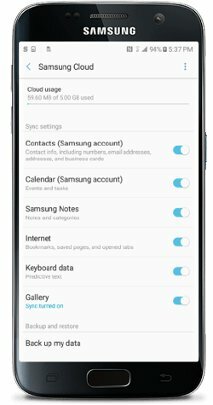 By default Samsung Cloud Backup will be stop to run when the phone battery is less then 10%. How to Use SAMSUNG CLOUD BACKUP ? Easy Way to Backup & Restore ASUS ZENFONE 2 LASER Contact, SMS, Data, Picture Before Doing Hard Reset Format?